Soon is concerned that, based on the three new parcels sold this year (including eCO), there will be about 1,900 new homes coming up over the next few years in the neighborhood around the Tanah Merah MRT station. In addition, more supply is in the pipeline. For instance, next to eCO is another land parcel (Parcel B), located at the junction of New Upper Changi Road and Bedok South Avenue 3, that is earmarked for a 595-unit residential project sitting on the Reserve List of the government land sales programme. 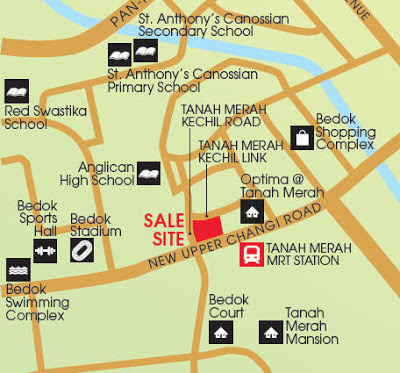 Adjacent to it, where the Tanah Merah MRT station is located, is a parcel designated for "future development". Even though prices have been stable, and the take-up rate at new launches have been healthy, Soon is concerned that there could be an oversupply in the next few years when these new condos are completed. David See, senior associate director of OrangeTee, who specializes in marketing units in District 16, is more sanguine. He reckons that, based on the bid prices by the developers, the new projects will be launched at higher prices. For instance, the 343,171sqft Land Parcel A, located on New Upper Changi Road and Bedok Road, was put up for sale in August and won by Keppel Land last month with a bid of $434.55 million($791psf ppr). The price for the 99-year leasehold site paid by KeppelLand was just 7.1% higher than the second-highest bidder, a joint venture between Fragrance Group and World Class Land. Incidentally, in August, Fragrance and World Class Land won the tender for a smaller parcel of around 150,700sqft across New Upper Changi Road, with a bid of $285.22 million ($676psf ppr). It is estimated that the new condo, called Urban Vista, will have 550 units, and it is expected to be launched in the coming months. Keppel Land's bid price of $791psf ppr was a record price paid for a residential development land parcel in the suburbs, and is at a 48% premium to the price the Far East-Frasers Centrepoint-Seikisui House consortium paid for eCO's site in February. Following the close of the tender for the site on New Upper Changi Roadon Oct 16, Joseph Tan, CBRE's executive director of residential services, commented: " The 11 bids garnered for the site and the quantum of the bids show that developers are confident that this residential project will be well received when launched." Tan estimates Keppel Land's breakeven at $1,200psf, with the selling price of the new project pegged around $1,400psf, which is slightly higher than the average $1,300psf achieved at eCO so far. Keppel Landintends to develop a residential project with about 700 units on the site, with sizes ranging from 500 to 1,400sqft. No Comment to " Property Spotlight: Tanah Merah vicinity (Part 2) "